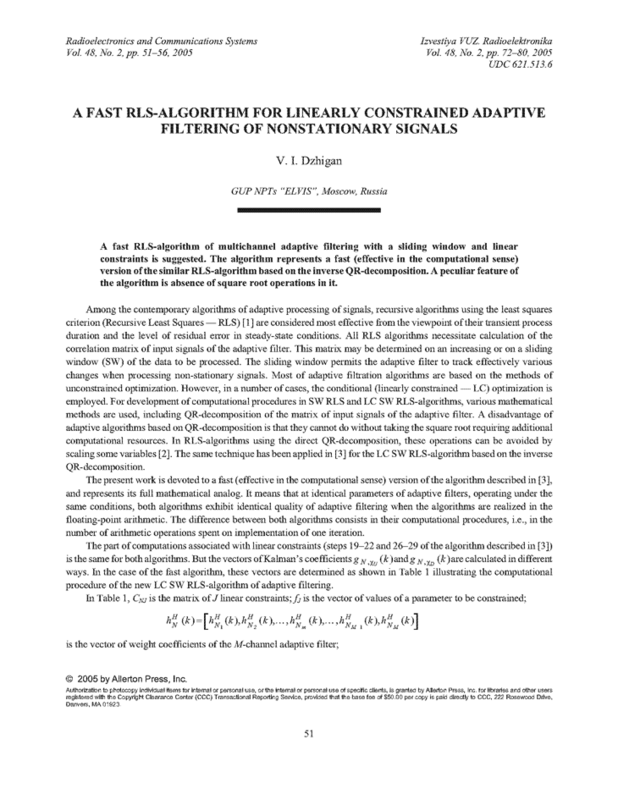 A fast RLS-algorithm of multichannel adaptive filtering with a sliding window and linear constraints is suggested. The algorithm represents a fast (effective in the computational sense) version of the similar RLS-algorithm based on the inverse QR-decomposition. A peculiar feature of the algorithm is absence of square root operations in it. SAYED, A.H. Fundamentals of Adaptive Filtering. Hoboken, NJ: John Wiley and Sons, Inc., 2003. HSIEH, S.F. ; LIU, K.J.R. ; YAO, K. A unified square-root-free approach for QRD based recursive least squares estimation. IEEE Trans. Signal Process., v.41, n.3, p.1405-1409, 1993. DOI: http://doi.org/10.1109/78.205742. DJIGAN, V.I. Radioelectron. Commun. Syst., v.47, n.8, p.29-38, 2004. ZELNIKER, G.; TAYLOR, F.J. Advanced Digital Signal Processing: Theory and Applications. New York: Marcel Dekker, Inc., 1994. KALOUPTSIDIS, N.; THEODORIDIS, S. (ed.). Adaptive System Identification and Signal Processing Algorithm. Englewood Cliffs, NJ: Prentice-Hall, 1993. PROUDER, I.K. Fast time-series adaptive-filtering algorithm based on the QRD inverse-updates method. IEE Proc. Vision, Image and Signal Processing, v.141, n.5, p.325-333, 1994. DOI: http://doi.org/10.1049/ip-vis:19941426. GLENTIS, G.-O.A. ; KALOUPTSIDIS, N. Fast adaptive algorithms for multichannel filtering and system identification. IEEE Trans. Signal Process., v.40, n.10, p.2433-2458, 1992. DOI: http://doi.org/10.1109/78.157288. DJIGAN, V.I. Izv. VUZ. Elektronika, n.1, p.83-90, 2004. GAY, S.L. Dynamically regularized fast RLS with application to echo cancellation. Proc. ICASSP’96, 9 May 1996. IEEE, 1996, p.957-960. DOI: http://doi.org/10.1109/ICASSP.1996.543281.